This drawing was identified as a view of Dawes Point, Sydney by Elizabeth Ellis, Curator of Pictures, State Library of New South Wales. Features in this drawing include the Miles Building, a three-storey warehouse in the centre of the image, and Dawes Battery at the base of the flagpole. It can be dated before 1846, at which time a stone wall was constructed around the waterline at Dawes Point. 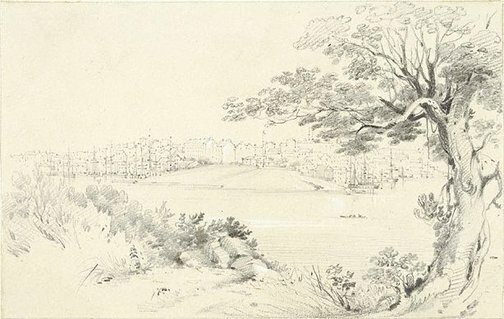 It may have been drawn from the residence of Thomas Lloyd on the north shore, as there are several works extant from a similar viewpoint, although this one seems to be from closer to the waterline. It was page 16 from an album of various drawings and prints compiled by Sophia Ives Campbell from 1847, now dispersed. A list of the contents and bindings are held by the Mitchell Library, Sydney. A student of Martens, Miss Campbell is recorded in his account book (Mitchell Library, Sydney) as having purchased four watercolours and three pencil sketches from him on 12 July 1850.